You could be rolling in dough if you find one of these special dishes. You've definitely seen those old-fashioned Pyrex dishes somewhere. The brightly hued containers — often decorated with floral motifs — can be found at yard sales, grandparents' homes or even your own kitchen cupboard. Maybe you only use them for cooking that special stuffing or dressing to serve with the turkey on Thanksgiving ... or maybe they're just collecting dust. Before you decide to donate or toss any of that outdated glassware, think twice: Vintage Pyrex sets have sold for up to $1,800 online. Even single bowls have gone for a whopping $900 and this "Foulard Pyrex mug" on Etsy is up for sale at $800. Think you're sitting on a vintage Pyrex gold mine? Look out for opaque, brightly colored pieces that often feature floral or geometric designs. While you're home for the holidays and everyone else is watching football, consider going through the cupboards to see if you can discover any hidden Pyrex treasures. Social media is flush with posts from Pyrex enthusiasts, too. Vintage Pyrex collectors are currently sharing their glassware hauls, swaps and purchases on dozens of Pyrex Facebook groups. The hashtag #pyrexjunkie on Instagram reveals over 23,000 posts from the glassware aficionados. Between avid collectors and other home cooks, the century-old Pyrex brand is still beloved by many. Pyrex can go in the fridge, freezer, oven, and stove top. I haven't had any break, despite dropping them occasionally. Love it! So why is this American dishware so coveted? 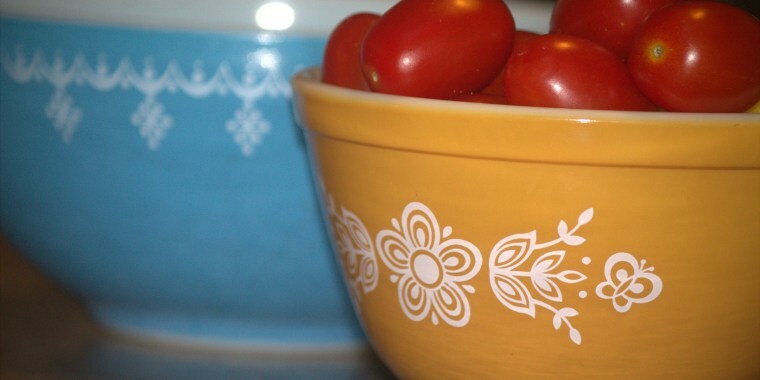 Vintage Pyrex has been hailed for its durability and longevity. Once Pyrex changed its formula to soda-lime, instead of the arguably stronger borosilicate, discontinued Pyrex dishes made with the original glass formula became even more valuable. Today, pieces made between 1915 and the late 1970s are sought out by thousands of Pyrex collectors. Vintage Pyrex is so special that it's even made it into the Corning Museum of Glass. So, check your cupboards for that vintage dishware — you might be sitting on a fortune!